Do you constantly fear losing all of your data due to viruses and malwares? Do you always feel the risk of your precious data being stolen or damaged? Then here is FortiClient antivirus software to put all your fears and risks away. Though being a lesser known antivirus software, it is a promising and costs you nothing. Yes, it is absolutely free! Let us look at some of the features of this antivirus software that would help you decide to opt for it. 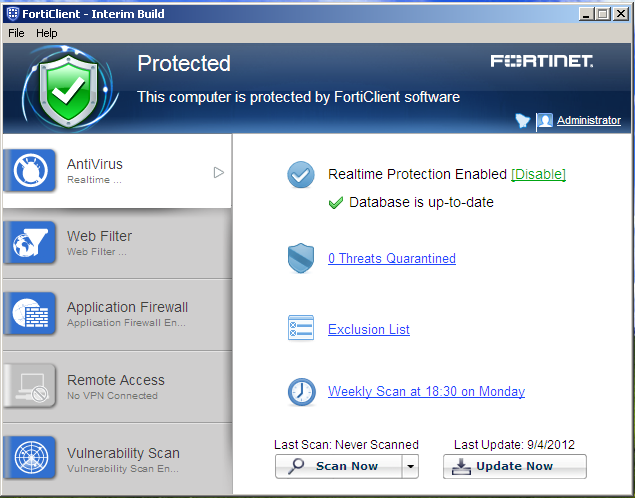 Effectiveness: FortiClient is a highly awarded antivirus software. Passing the file detection test with flying colors, the antivirus software received the highest rating of Advanced+. Virus Bulletin carries out a Vb100, a comparison test and FortiClient has won 9 out of 10 Vb100 awards. FortiClient achieved 2nd place in the “Desktop Malware Detection Test” conducted by PCSL with 99.9% detection. Results of tests varied out by NSS Labs shows that the block rate of FortiClient was 99.8% due to which it stands at second place. Splendid Phishing Protection: In FortiClient another major feature to highlight is the web security which acts as a web filter. This feature blocks access to malicious URLs, empowers parental control system and directs the user away from phishing websites. Whether you are streaming hot music, banking shopping online or downloading your favorite movies, this antivirus is providing you complete real-time protection. Easy Installation: The appropriate security components are installed on the user’s desktop by FortiClient installer. It requires minimum human intervention. Before installing the actual product, the installer runs a scan for active malware. This check of active malware before installation proves to be a plus point of the software. FortiClient is easy to configure and most of the settings can be left as default. FortiClient provides a feature which allows to lock the software with a password. With so many other antivirus software competing in the market, one might wonder why should we opt for FortiClient antivirus software. The software is very easy to install requiring minimum human intervention. It has clean web interface and is very user-friendly. And as said earlier, the results of the AV test, which are very impressive of FortiClient, makes the job of opting for it all very easier. It provides you complete security against viruses, Trojans, worms, spyware, adware, and all other threats that are out there to destroy your data. FortiClient will protect your PC for free as compared to other antivirus companies in the market for which you will have to pay. FortiClient Antivirus is an excellent option to protect your PC available for free. It does a good job at keeping all the risks that would harm your PC at bay and thus proves to be very useful.